SHIP BOTTOM, N.J. - Oct. 23, 2018 - PRLog -- Southern Ocean County Chamber of Commerce has been the regional champion for the Shop Small movement since American Express launched the campaign in 2010. The member businesses have been working with the chamber to cultivate events and utilize activities to build a large stock unique incentives for consumers to shop the Long Beach Island Region each Thanksgiving Weekend. From open houses and ongoing shop local incentives throughout the holiday season, it all kicks off on November 24, after Black Friday shopping frenzy has subsided. Encouraging promotion of Gift Cards for favorite restaurants, shops, lessons or services is a fantastic way to give back to local businesses who create employment, donate to local causes and provide much needed expertise. The Chamber kicks off the Shopping Season with local businesses at their November 14 membership meeting. Keeping with tradition, an ongoing and updated list of specials and events will be added to the www.visitlbiregion.com website and on their social platforms that include @southernoceanchamber and @LBIregion . A variety of business interviews will be aired throughout November and December on WBNJ 91.9FM on the Southern Ocean Chamber's LBI Region Report Radio Show each Monday at 9am. A sampling of the Shop Small Business Saturday offers include in store retail promotions such as Jetty Flag Ship Store in Manahawkin, Farias Surf & Sport in Ship Bottom, The Haymarket Toy Store in Ship Bottom, Reynolds Garden Shop in Manahawkin, Ann Coen Gallery in Surf City, By Water Shop in Long Beach Township, Artifacts & Co in Beach Haven. 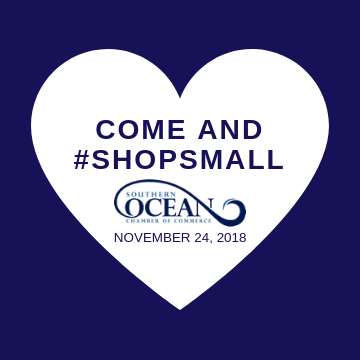 Restaurants are also offering day of specials such as Creperie de la Mer – 11/24 – free French press coffee or tea, hot or iced, with the purchase of sweet or savory crepe and Delaware Avenue Oyster House – Beach Haven Terrace Wine and mixer Gift Baskets and gift certificate specials & Pop Up Shop. Enhance your shopping day with events such as Long Beach Island Foundation – Holiday Market Festival, The Union Market and Gallery Tuckerton, Made on Main event and Santa's Viking Village Market in Barnegat Light. . Other ways to spend the day is Thanks 4 Giving Run in Beach Haven at 9am to support the Hunger Foundation of Southern Ocean, Santa Visits at Bay Village, Viking Village and various Breakfast with Santa seatings happening throughout the day. A wide variety of special events and shows include a Holiday High Tea at Surflight's Showplace, Lizzie Rose Music Room Bell Bottom Blues Concert, Horse & Carriage Rides at Kapler's Pharmacy, LBI Museum Celebrate the Season Open House and South End Surf and Paddle Ukulele lessons during the day and double feature screening of Lighthouse International Film Festival features in the evening.